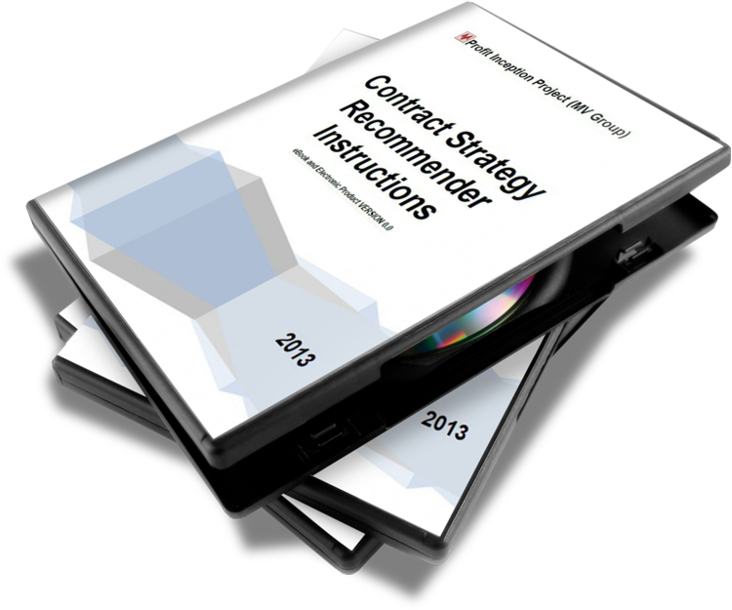 Get your copy now of one of the most user-friendly INTERACTIVE Contract Strategy Recommender (CSR) used within major multinational companies from Oil&Gas, Metallurgical, and other industries as a reliable and practical advisory tool in their daily project management and procurement endeavors. Regardless of the fact whether you are in beneficiary’s/principal’s/client’s/customer’s seat, or the one of the vendor/supplier, by purchasing this product you are opening basically one of the “Pandora’s Boxes” of the Consultancy Industry which charges your company a fortune in order to present rather comparable simulation results. Once opened, however, you will benefit at great extent of the outcomes presented within CSR. The bottom line is that the CSR Model is a priceless tool when it comes to establishing the most appropriate contracting strategy for any purchasing initiatives and/or presenting any competitive and profitable proposal to any prospective clients. This is a limited offer negotiated directly with the publishers: First 1000 copies are to be sold for an Exceptional promotional price of ONLY USD 39,90 (instead of regular price of USD 79,90). In addition you get a 30 (thirty) calendar days GUARANTEE period for a 100% refund in case this product (electronic simulation model and ebook) hasn’t met your expectations in terms of provided content. 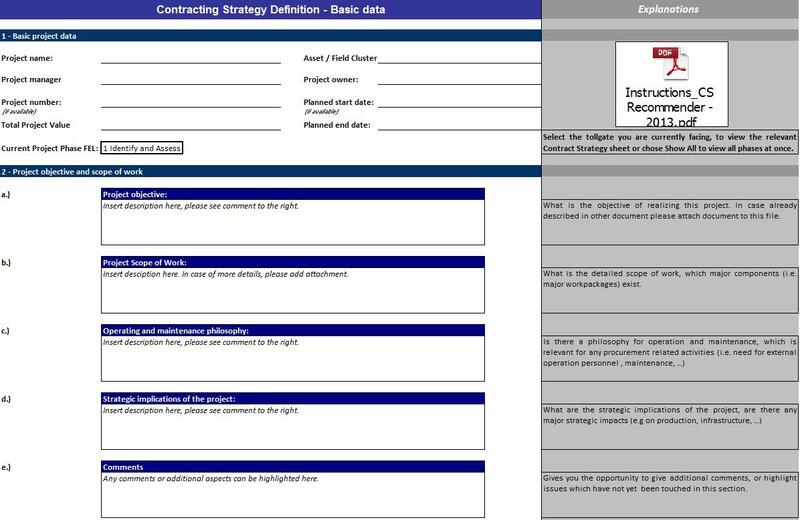 The Contract Strategy Recommender (CSR) is a business case simulation tool designed in MS Excel intended to support the decision, which contract strategy to use within a project and to provide a transparent record of the process. One should be aware, however, that the recommended model shall be treated as a recommendation. A tool can never displace years of project experience, therefore deviations from the recommended model are valid, but need to be properly justified. It is built to be applicable in every contracting strategy related phase of a project. 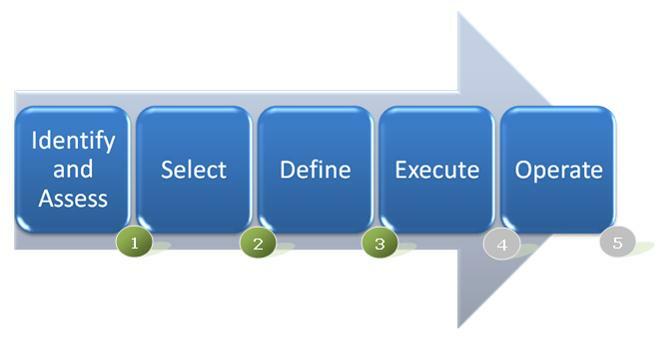 the execution at the end of phase Define (FEL3). The sheets in Excel are separated into two blocks, an input area and explanations (Explanations are not part of the print range). For every changeable input field in area 1 an explanation is given in area 2. Therefore this guide describes the overall structure and functionality of the model, but not details of the inner contents. 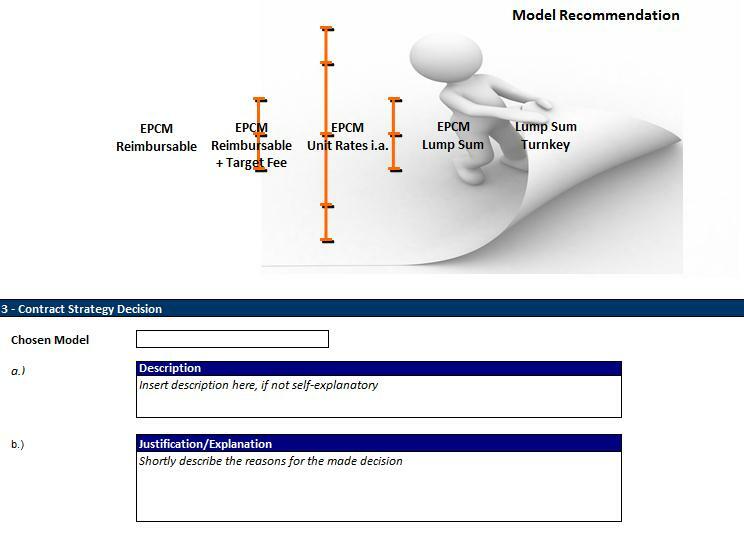 The model consists of two parts, an introductive cover sheet for general information about the project/purchasing initiative and the actual decision model. The cover provides space for all essential project information, mostly self-describing. One essential part is the choice box for the current tollgate. As there are more criteria to be considered to decide upon an execution strategy compared to the decision for the feasibility study the model must adopt itself to the current phase you are entering. By selecting the current phase the matching sheet is shown. A project, for example, usually consists of multiple work packages, at times even with different contracting strategies than the main project package. Using the “+” and “–” Button work packages can be added or deleted (one package minimum=main package). If a work package needs a separate consideration regarding the contracting strategy (choice box) an additional evaluation sheet is provided. The sum of the work packages must be identical to the overall project value. The second part of the tool is set up in form of a questionnaire. By simply selecting the appropriate rating for every criterion, the project is evaluated. The preset weightings are suggestions and can be adapted to the specific project. 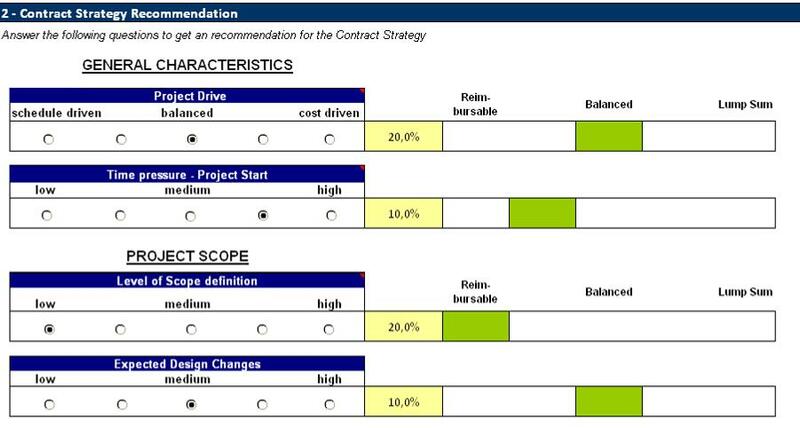 In the right part of the questionnaire the respective impact on the contract strategy is displayed. In general there are also K/O-criteria which can make the usage of a contract strategy inadvisable and/or at least as highly not recommendable. If such issues come up they are shown right next to the respective question and in the final model recommendation graph as well. To provide a final recommendation the rating of the individual criteria is taken together and summed up. According to the calculated rating the crosshair is pointing at the recommended model. Please note that there is a range of tolerance symbolized by the width of the crosshair. Please note that the recommended model is a recommendation. A tool can never displace years of project experience. Therefore deviations from the recommended model are valid, but need to be justified. The affiliated CSR Instructions (eBook in PDF Format) can be accessed directly from the Excel Simulation Model as shown below (i.e. double click on the PDF icon).